The concept of measuring business performance is not new. Successful companies have being doing it for hundreds of years. As a junior consultant I was first introduced to measurement through the Philip Crosby school of total quality management. The lesson was simple; quality is defined as conformance to requirements. Define what you require and anything else is scrap, rework or waste. Working with the (Alexander) Proudfoot management consultancy I was taught –“If you can’t measure it, you can’t manage it” and – “If you control the parts you control the whole”. These authors were promoting their thinking on these topics around 1960. Over the last 50 years the measurement industry has exploded and the need to have measures in a business is now largely considered mandatory. But the activity of last 50 years has also clouded the issue. There are so many schools of thought; so many voices in the market that the foundation intent for having measurement has become blurred, confused and generally mired in consultant speak. This paper does not question the need for having performance measures in the business. For mine, Crosby’s definition of quality and the two Proudfoot management mantras provide all the rationale required for having measures in a business. It is only a question of scale. Also, the paper does not set out to become a guide as to which measures to use in a business. Rather its intent is to assist to demystify this topic and to provide a foundation construct for the reader to use when establishing their own measures. My view on measurement recognises four frames. The community view is the relationship with suppliers and customers – the extended value chain. An understanding of the nature and impact of decisions that will be made as a consequence of the performance measures will assist in defining what measures should be included in the scorecard. It is important to consider how the behaviour will change as a result of ‘knowing the answer’. If you measure things that you have no means of responding to, then it is not worth measuring them at all. The more senior a manager, the more influential their decision making authority is and the medium and long term become increasingly important. This provides the following variables. Scope / influence of authority within the business. Time horizon – short, medium, long term. Seniority within the business will also dictate whether lead or lag indicators should be more or less important to a manager. I consider three measurement types to be relevant to the business community. (The IT community may include a few extra types). This view is characterised by the principle that it is more important to manage the future than it is to manage the past – or in more colloquial terms, to ensure the light in the tunnel is not a train. The dominant characteristics are highlighted. To have a horizontal view in a business automatically implies seniority (mid level management and above) and a high performing value chain requires the management group work together as a team and for the team to take collective responsibility for the performance of the value chain. The need for a high performing team is so important that the relationships should be managed by Working Level Agreements (WLA). WLAs recognise that the individual manager within the team has limited authority and the success of the team therefore relies on each manager to be fully contributing their share to the success of the value chain. The WLA is the contract / agreement between the parts of the value chain. (The author recognises that this relationship can be managed by SLAs. It’s only a question of terminology and scope). At this level, lead indicators are more important. Eg. Number of purchase orders issued is a lead indicator to operational health. If you are not buying anything, then you are going to run out of production material and the business will stop. Accounts receivable and debtor days are lead indicators to financial health. If you are not creating debt (selling) and/or not collecting the debt, then you are going out of business. Inventory holdings are lead indicators to sales. Increasing inventory potentially means sales are falling off and the business is running out of working capital. Typically lead indicators are characterised by volume as defined by their unit of measure, being generally either units or currency. Eg- Volume of purchase orders issued. Total value of purchase orders issued. Total inventory holdings, Total value of inventory. The team should have a set of KPI’s for the value chain for which they are collectively responsible. These KPIs measure the value created through the value chain. From a performance management view, decision making is operational. Strategic decisions such as insource/outsource are made to impact specific operational performance measures. The vertical view has a restrictive scope and applies to specific departments, divisions or sub sections thereof. To have a vertical view in the business is to work in a silo. The focus is on the managers specific area of accountability. An important differentiator between the vertical and horizontal view is that vertical view is equally applicable to all levels of management, from team supervisors to executives and the horizontal view is across functions at a senior level in the organisation. It is not uncommon for executives to use the same indicators as a lag indicator for their portfolio and a lead indicator for the value chain. But at the lower levels of management and supervision this duality does not exist. Here the question is “How can we do more with less”? The focus is on process efficiency and examining why process targets were not met. Supervisors will ask – what went wrong and how can we do better next time. Accountability is at the individual level. “This is your department – you are responsible for what happens in it”. A team environment does exist, except that it is a vertical team. Eg the Finance team or the operations team. The team relies on each other to manage their sub departments and the KPIs for each sub department are a disaggregation of the overall departments’ performance indicators. This relationship is termed the Hierarchy of Dependant Objectives (HODO). HODO describes the operational communication between levels of management. The volume flows measured as lead indictors for the value chain become the volume drivers for setting resource levels and measuring asset productivity with lag indicators. Consider a business that has an aggregate forecasted demand of 240,000 units for the next 12 months. In the simplest of terms, the business will need to produce 20,000 units per month to meet demand. To increase the complexity slightly, consider that the business has two production plants. This means that each plant should produce 10,000 units per month. Now consider that the business sells 4 different product types. Each plant is responsible for two lines. This means that each plant should produce 5000 units of each line per month. The plants must produce 1,250 units per week or 250 units per day or 34 units per hour (7.5 hour shift). To summarise – if the business produces 34 units per hour across 4 products, across 2 plants, then it will meet the operational requirements of the business. The disaggregation of requirements down a silo is shown in the following graphic. The two arrow sequences (red (down) and green (up)) represent the hierarchy of dependant objectives. Note, when requirements are being disaggregated, Schedule goes to Forecast. This is vital as you cannot have a lower level management working on an operational time line longer than that of the next level of senior management. When performance measures are being aggregated up the hierarchy, measure goes to measure. The community view recognises the importance of third party customers and suppliers and their relationship to the business. These relationships are different from the horizontal view in that neither the supplier nor customer has authority over the other. The supplier is contracted (formally or informally) to provide services to the customer. (Services include the delivery of product). The contract is managed by monitoring adherence to service levels (SLA’s) imposed on the supplier by the customer. Typically these will include performance measures on Time, Cost and Quality. The more the supplier and customer can work as a team the better the relationship will be. In this case the relationship can be managed with a combined scorecard. The Customer will use lag indicators to measure the suppliers’ performance and the supplier will use lead indicators to evaluate the viability / health of the relationship. In the event that the two parties do not have a team based relationship, then the customer is likely to manage with lag indicators and to show little regard for the suppliers lead indicators. It is also common that SLAs are used within a business and this does not conflict with the community view. The internal, interdepartmental relationships at the process level often require SLAs to manage them. 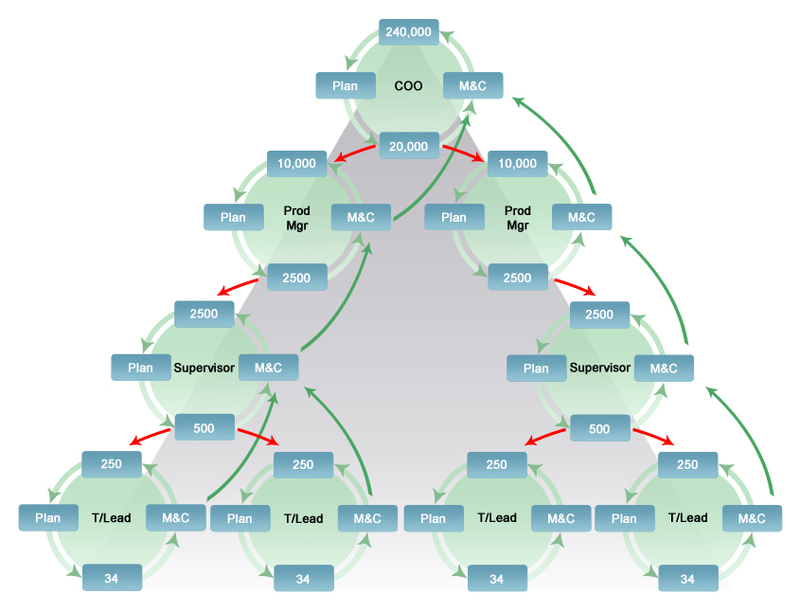 WLAs manage the value chain, SLAs manage the inter process relationship. Typically process level SLAs are best suited for managing the relationship between the front and back offices – or the customer facing, revenue generating processes and the non customer facing, revenue support processes. These are different from the foundation processes that are well removed from the customer altogether. 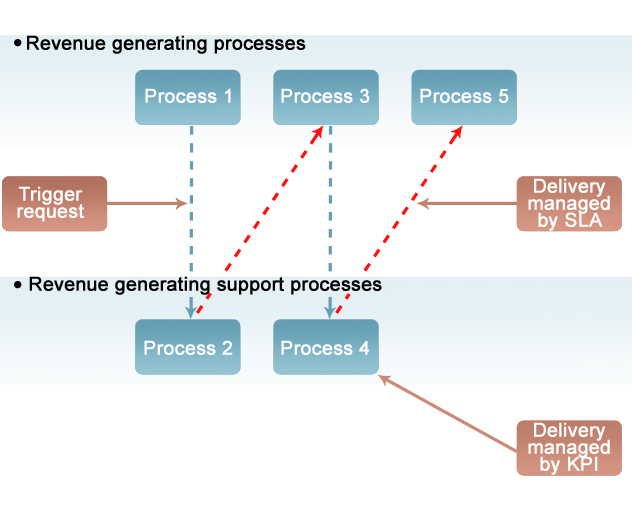 The customer facing process triggers the customer facing support process to start. This process must complete in an agreed time and produce an output of agreed quality at an agreed cost. Adherence to this Cost/Quality/Time combination allows the customer facing process (role) to make promises to the external customer that can be relied on. Here KPIs are within the process and SLAS are managing the relationship between the processes and every formal SLA requires an equally formal trigger. The strategic view encompasses the entire business or major operating divisions within the company, depending on the size of the company. The dominant characteristics are highlighted. I have discussed this model in a separate paper, so I will summarise here. Growth refers to the markets the company operates in. The basic decision is around the product/market mix and the go to market model. Profitability refers to the revenues and margins derived from the ‘growth’ decisions. Growth and Profitability combine to create demand on the business. This drives asset productivity and the key measure is Return on Capital Employed. Financing refers to the mechanisms that the company uses to finance growth. Typically the options are debt or equity. Profitability, Financing and Asset Productivity require performance measures that are a mix of the vertical and horizontal views and should be constructed as ratios. This is not to say that ratios are not used in the other views or that the strategic view does not use stand alone measures. Rather it is to make the point that, at the strategic view, ratios are more insightful than individual measures. The ratios should be cross functional blending finance and operations and marketing. Ratios that stay within their own discipline (eg Finance) could mask what would otherwise be strategic insights. Performance measures for growth should focus on competitive intelligence and analysis. This could include measures such as market share, relative market share, new product development and activity in niche markets. In closing, effective performance management requires that each measure is associated with a target/budget. Measuring actual performance without having an ‘expected result’ to compare it to, is largely a waste of time. ‘If you don’t know where you are going, any road will get you there’.